tl;dr: And Joy Reid will help him! REID: They are very disorganized, the Democrats, are not, they’re not good at the sort of “Go for the jugular,” hard-nosed politics as they used to be, back when the Democrats were more sort of an ethnic party, they were kind of ethnic white, ethnic black, ethnic party generally…. Because Democrats, although they understand, I think, deep down that they’re the party of black and brown people, of gay people, of marginalized people, they still long to be the party of the sort of Pabst Blue Ribbon voter, the kind of Coors Lite-drinking voter…. those voters are Republicans. They just are. I think what tips an election is which party goes out and find more people who are like them. I mean, you know, this country has always been very tribal. Um, the tribes have sort of shifted back and forth between the parties, but we’re the same tribal country we’ve always been. Republicans are very good in going out and finding all the Republicans, every available potential Republican and getting them to vote. Even more striking is the invention of ethnic (labeled tribal) identities and their varied and plastic salience across the African continent. 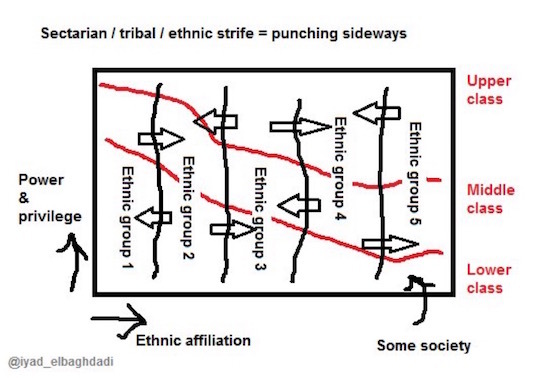 In some cases, “tribal identifies” have been invented in order to unite colonial and post-colonial clerical workers or other occupational and social groups to serve the interests of the members even though they were not bound together by language or lineage. In the United States, where similar derogatory language of tribe has been used to characterize and stereotype Native American or First Nations peoples, the identity has been reified in federal legislation that requires “tribes,” formerly under the Bureau of Indian Affairs, to accept that formal tribal identification in order to access the hunting, fishing, farming, and casino rights of reservations. Almost humorously, the Menominee peoples of Wisconsin decided to decline that nomenclature because many members lived in Milwaukee and other non-reservation sites; however, they then learned they must reverse that vote and re-declare themselves as “a tribe” in order to regain their reservation rights. 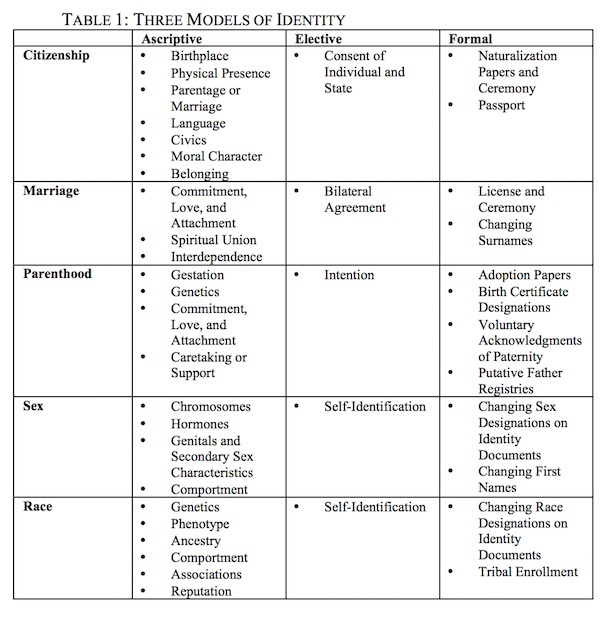 (Clarke gives definitions of ascriptive, elective, and formal identity — for Adolph Reed on ascriptive identity, see here — but I think the definitions are clear enough for our purposes from the examples in the table.) However, if we look back to Reid’s quote, we see that she conflates ascriptive identity (“black or brown”) with elective identity (“the sort of Pabst Blue Ribbon voter, the kind of Coors Lite-drinking voter”), and also conflates both of those with formal identity (if one’s ethnicity be defined by one’s own citizenship papers, or those of one’s parents, or a changed surname; one thinks of Asian cultures putting the family name last in American culture, for example). So there is no coherence to be found here, either. AMANDLA STENBERG: Janelle frigging Monáe!? JANELLE MONÁE: Hi, sweetie. You know I love, love, love you. First: pronouns! I want to make sure that I’m being respectful of how I’m referring to you. I know that the way we view ourselves and how we want to be addressed can change depending on where we are in life. AS: I love that you asked me! Thank you. I have felt at times that she/her pronouns weren’t entirely fitting, but I’ve never felt uncomfortable with them. It’s more important for me to open up that conversation around pronouns and how gender itself is a construct that doesn’t make much sense in our society. JM: Got it. I remember seeing you for the first time in Colombiana, and then, like many people, I was drawn to your character in The Hunger Games as Rue. I’m a huge sci-fi nerd, so just seeing this little black girl in a dystopian world being a hero for an oppressed community, I was intrigued! The way you embodied this character felt like you were mature enough to understand how important she was to the movie but also how important the Rues all over the world are to our society. AS: That’s one of the best compliments that I’ve received! I remember we saw each other at the Tyler, the Creator show; we took a picture with Solange. You were wearing a jacket that said “black girl magic” on it, and I flipped out. JM: Me, too! I was like, I am right between you and Solange, two people who are the epitome of black girl magic! I saw you later on, and you had just shot Everything, Everything, which, by the way, you are incredible in. The original story was written by a black woman [NicolaYoon], and your director [Stella Meghie] is also a black woman. What was going through your mind as you were considering the role? AS: I kind of wrote it off initially because I figured it was one of those instances where I was receiving a script for a YA romance project that was intended for a white actress. I thought maybe they’d float the idea of casting it in a more diverse manner but that ultimately it wouldn’t end up going that direction, because that’s happened to me a lot. Then I realized that this project was based on a book written by a black woman and that the casting was intentionally diverse. I’d never seen a story like this made for an interracial couple. I’m not someone who generally has a pop or mainstream sensibility, but I see the incredible power of infiltrating these larger movies that show a lot of people who we are and how diverse and beautiful our community is. I thought it would be really powerful to see a black girl [lead] character like Maddy who is joyous and creative and dimensional specifically marketed to teenagers and young adults. We don’t always get to see black women carrying that energy. That’s one of the reasons why I respect and love you so much—because I feel like you perpetuate such whimsy and joy! JM: Aw! Well, whenever I see you doing your thing, I feel like we’re from the same tribe because I take a similar approach when I’m choosing projects. With the roles of Teresa in Moonlight and Ms. Mary Jackson in Hidden Figures, they’re two women of color from totally different backgrounds and eras—from the hood to NASA, these black women were the backbones of their communities. I thought it was so important to let the rest of the world know that we’re not monolithic. And with Hidden Figures in particular, I was so proud to be a part of exposing that if it were not for these women, we would not have gone to space. That’s American history! Black history is part of American history, and it should be treated as such. 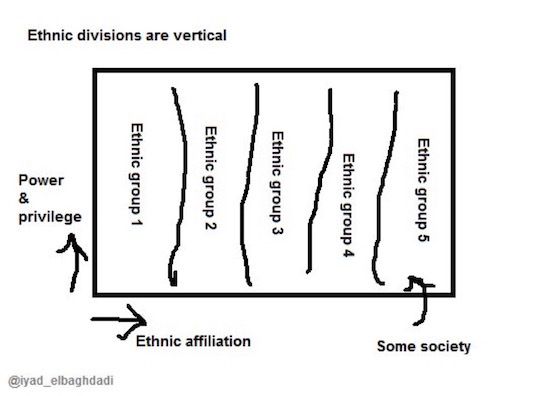 Comment: Taking once again El-Baghdadi’s “ethnic affiliation,” as a proxy for Reid’s “tribe,” and conceptualizing WASPs as a tribe, it’s clear to me, if I look at my own history, that I’m more likely ti have good luck than some other tribes. I’m more likely to have intergenerational wealth in the form of a house, or even financial assets, more likely to be highly educated, more likely to have the markers and locutions that enable me to interact successfully with bureaucratic functionaries, etc. I didn’t earn any of those advantages; I would have had to have chosen to be born to different parents to avoid them. I think we can agree that if we were looking for an operational definition of justice, this wouldn’t be it. Comment: Classically, we have owners following Gould’s maxim by bringing in (mostly black) scabs to break the Homestead Strike in 1892, with a resulting “tribal” conflict — although those scabs might protest — and rightly — that (a) they were only trying to provide for their families and (b) that the Jim Crow system had denied them the “good jobs” that in justice would have given them (leaving aside the question of who implemented Jim Crow, and for what material benefits). 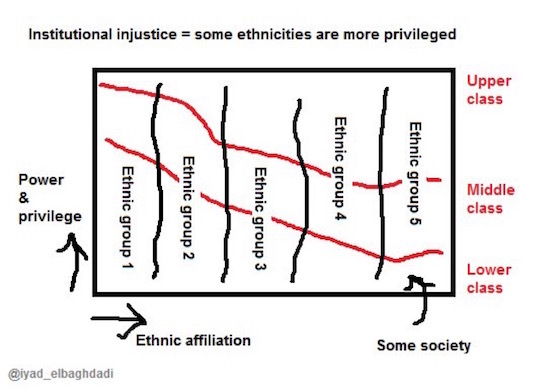 In modern times we have “tribes” (white, black, Asian, at the least) battling on the field of “affirmative action” having weaponized their ascriptive identities. 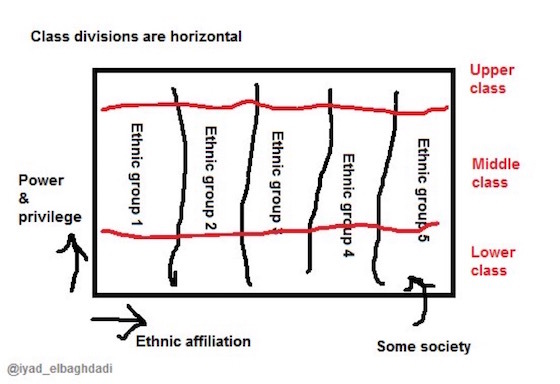 Here again, representatives of some “tribes” would protest — and rightly — that systems like “legacy admissions” give some “tribes” unjust advantage over others, but the hidden assumption is one of resource constraint; given a pie of fixed size, if Tribe A is to have more, Tribe B must have less. Note that programs like “tuition-free college” tend to eliminate the resource constraint, but are “politically feasible” only if Tribes A and B solve their collective action problem, which is unlikely to be done based on tribalism. 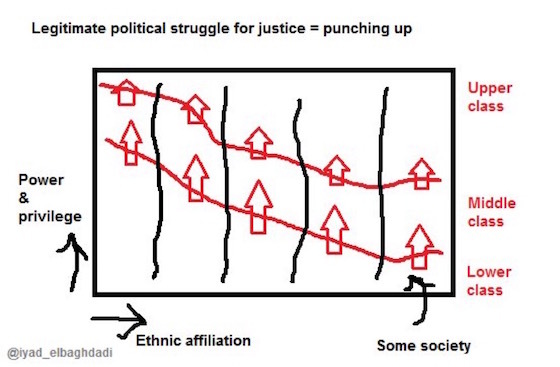 Comment: This diagram implies that the only “legitimate” form of seeking justice is vertical, “punching up.” This eliminates clear cases where justice is needed within and not between classes, like auto collisions, for example, or the household division of labor. More centrally, the nice thing about thinking vertically is that it eliminates obvious absurdities like “Justice for black people means making the CEO of a major bank black (ignoring the injustices perpetrated using class-based tools disproportionately against black people in, say, the foreclosure crisis, where a generation’s-worth of black household wealth was wiped out under America’s first black President). Or obvious absurdities where justice is conceived of as a woman, instead of a man, using the power of office to kill thousands of black and brown people, many of them women, to further America’s imperial mission. Concluding a discussion on politics and power that has barely begun — and is of great importance if you believe, as I do, that we’re on the midst of and ongoing and highly volatile legitimacy crisis that involves the break-up and/or realignment of both major parties — it seems to me that El-Baghdadi visual representation, which fits tribalism into a class-driven framework, is both analytically coherent (as Reid’s usage of “tribe” is not) and points to a way forward from our current political arrangements (as Reid’s strategy of bundling “punching sideways” tribes into parties while ignoring class does not). More to come…. In the United States, “tribes” are not generally thought of as political entities, unless we’re thinking of “The Tribes,” sovereign or quasi-sovereign Native American entities like the Lakota or the Penobscots. It may be that the very vaguess and imprecision of the term is useful, since it can only be defined operationally by referring to a “higher” “authority,” as for example by filling out a form provided by the Bureau of Indian Affairs. Note that any serious strategist must have screamed in agony when they heard this sentence, because Coors and PBR drinkers are different demographics, and different geographically as well. This entry was posted in Guest Post, Politics on September 7, 2017 by Lambert Strether.